12 Volt Linear Actuators- What Makes Them So Popular? - Venture Mfg. Co. Linear actuators are devices which convert rotational motion into linear motion. The linear actuator is connected to a DC motor. The motor rotates and initiates motion in an actuator, thus making push and pull movements. This makes DC linear actuators ideal for pushing, pulling, lifting, adjusting, or tilting different objects that are otherwise hard-to-reach. All this can be achieved by just pressing a button. There are various types of linear actuators used for initiating rotary motion on large scale. The 12 volt linear actuators are one such types used on a large scale because of the optimum functioning it provides and various cost benefits. You must be thinking what are the cost benefits of these actuators? They can help you save move and do the job more efficiently. How? Read the following post to get the answer. What are the Benefits of 12 Volt Linear Actuators? Pulse width modulation is provided for variable speed control. There are multiple options for analog and digital feedback. The low voltage switching options have the capability to connect with programmable PC or PLC controllers directly. The device has limit switches that are fixed and can be programmed for “teach and repeat” positions. The 12 volt DC electric actuators require very less maintenance. In addition to this, they provide redundancy through manual override, and have a longer component life compared to that of other actuators. This helps reduce the down time. One of the key benefits of these actuators is that they are economical, and their components are inexpensive as compared to those of hydraulic and pneumatic systems. 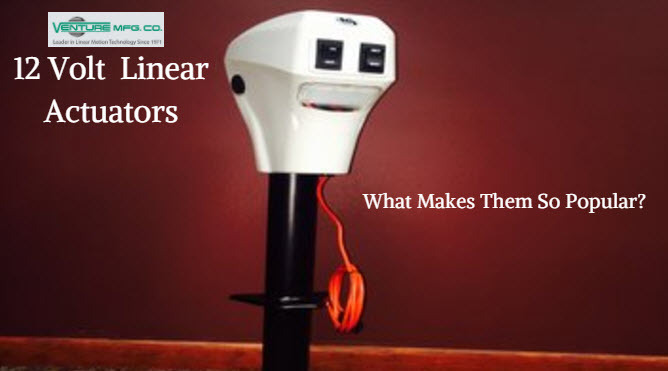 Installing a 12 volt electric actuator is easy and takes lesser time as compared to that taken by several hydraulic and pneumatic components. This helps in saving a considerable amount of costs in the OEM (Original Equipment Manufacturer) assembly. What are the Applications of 12 Volt Linear Actuators? The above explained cost benefits and a variety of applications make it clear why the 12 volt electric actuators are so popular. Earlier mentioned are just a few areas where heavy duty 12 volt linear actuators are used. To know more about the other areas, where you can use these types of actuators, you can contact the experts. One such expert, who can help and guide you in this is Venture Mfg Co. The company has a great experience, along with the expertise in manufacturing electric linear actuators of varied specifications based on your application requirements.